... 1917 (95 years ago today), the United States severed diplomatic relations with Germany. Germany's ambassador in Washington was dismissed, and his American counterpart in Berlin ordered to come home. The announcement was made by President Woodrow Wilson in response, The New York Times reported, to a "German notice that any merchant vessel which entered prescribed areas would be sunk without warning." Hours after Wilson's notice, on this same day, a German U-boat, or submarine, sunk a U.S. ocean liner, the Housatonic, off the Isles of Scilly at the southwestern tip of Britain. (credit for undated photo of the liner in port) Predicted was entry of the United States into the conflict that had been raging for 3 years in Europe. Indeed, the United States joined World War I in April of the same year. 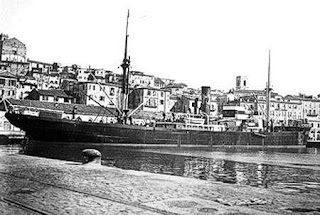 The Housatonic Steamship Company's claim against Germany would not be resolved until issuance of an arbitral award in 1926.